Although the rest of the world has to wait for it, the 5.99-inch Honor 7C has just been introduced in China. The specs of this handset also include a Qualcomm Snapdragon 450 processor, 3 GB or 4 GB RAM, a dual camera setup on the back, as well as Android Oreo-based firmware with Huawei's EMUI 8.0 on top. Those interested can purchase it in China already, where the list of color choices includes blue, black, gold, and red. Huawei's brand Honor has been quite busy lately, although many of their handsets are slightly modified Huawei phones or nothing more than rebranded ones. However, they always pack quite a punch for their price, and the new Honor 7C is no exception. With a price tag that reads around US$142 for the 3 GB RAM and 32 GB internal storage variant, the Honor 7C is now up for purchase in China. Its specs include a Qualcomm Snapdragon 450 processor, a 5.99-inch display with 1,440 x 720 pixels, microSD and dual-SIM support, a 13 MP + 2 MP camera setup on the back, an 8 MP selfie shooter, all with Android 8.0 Oreo on top. Obviously, the firmware reached this device only after receiving the EMUI 8.0 treatment from Huawei. The Honor 7C features a fingerprint reader on the back, but it also comes with Face Unlock. 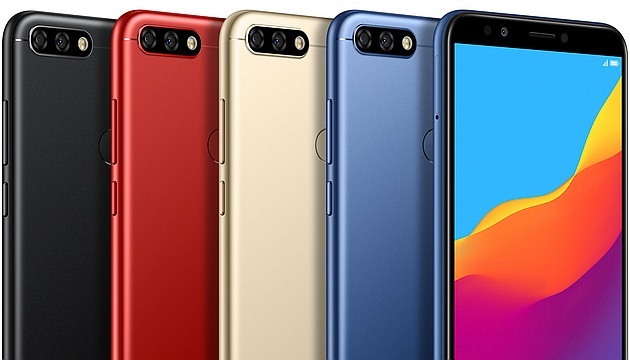 Unlike the flagships that also use IR cameras for facial recognition, this phablet only uses the front camera to identify its user. In addition to the version mentioned earlier, those who want a bit of extra memory and space can go for the 4 GB RAM and 64 GB internal storage variant. All the other specs remain the same, but the price gets up all the way to around US$205. For both variants, the list of color choices includes blue, red, gold, and black. Although only available in China for now, we expect to see the Honor 7C reaching many other markets in the weeks to come.